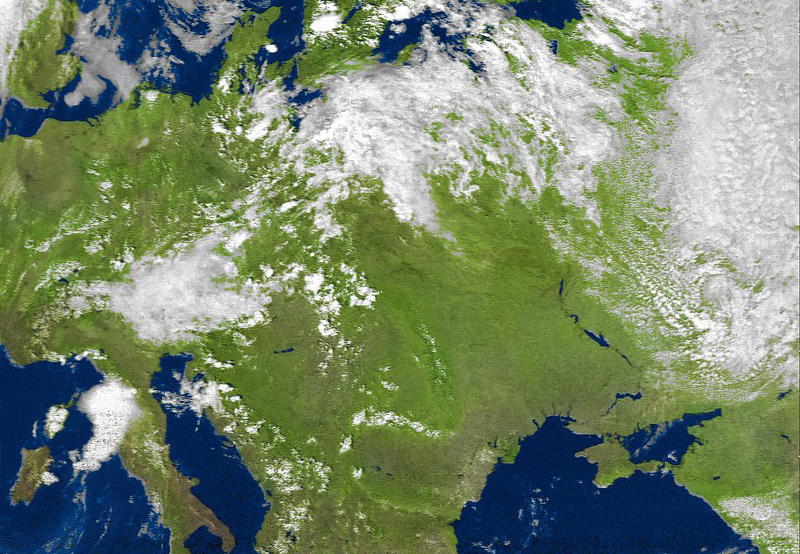 The National Oceanographic and Atmospheric Administration (NOAA) of the United States of America supports several Weather Satellites in Low Earth Orbit. 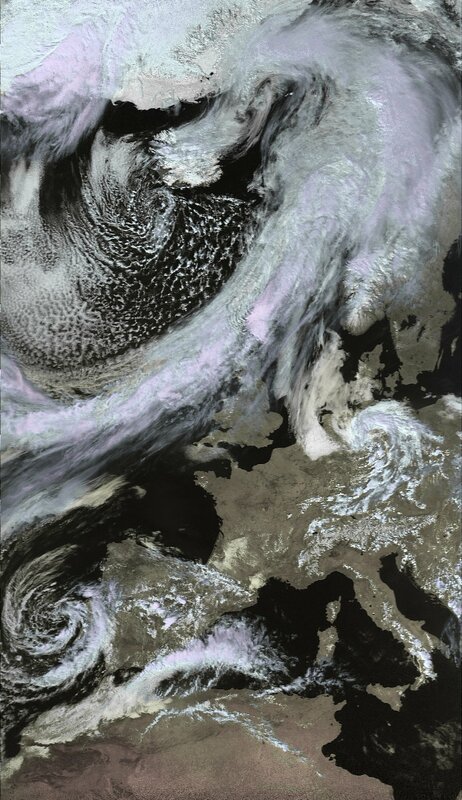 Currently these are NOAA-15, NOAA-18 and NOAA-19. 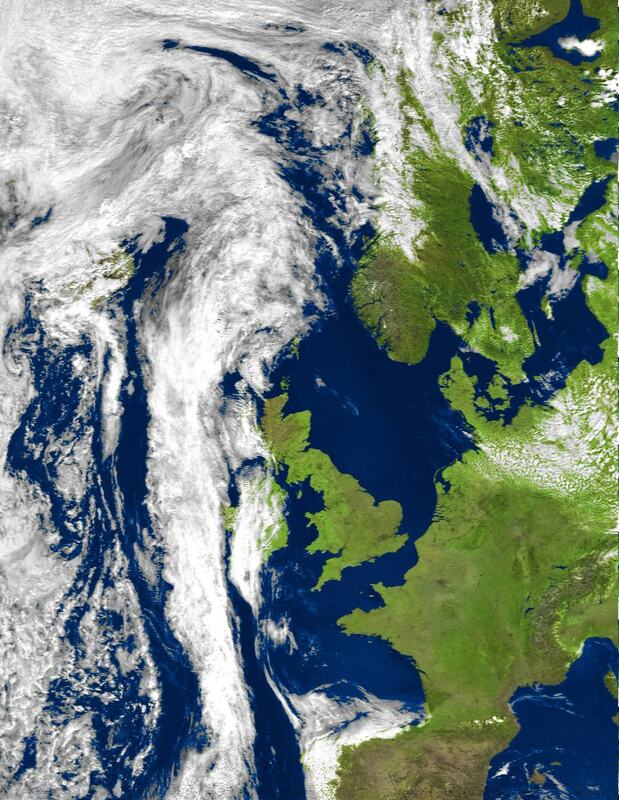 All three satellites broadcast using a system termed Automatic Picture Transmission (APT) in which they scan the Earth, 840 kilometres beneath them, continuously. This results in images that build up line by line, rather like the image on a TV screen. However, a complete APT image takes 12 to 14 minutes to build up at a rate of two lines per second. These transmissions are received on frequencies in the 137MHz band. 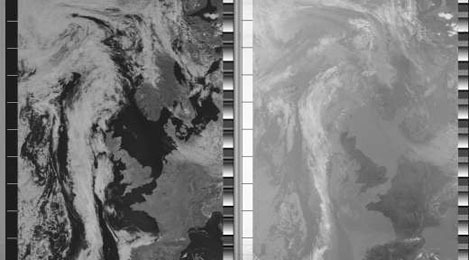 A typical NOAA satellite APT images consist of two frames, side by side as shown in the left-hand illustration below, taken from a NOAA-17 pass on July 13, 2003. 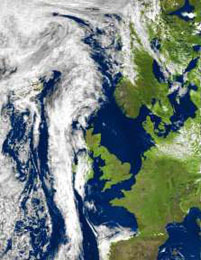 The left-hand image was acquired in visible wavelengths; that to the right was imaged in infrared. These images are transmitted as greyscale images (i. e. no colour). With the exception of the winter months, when solar illumination is relatively weak, software can be used to combine these two monochrome images into a colour composite like the one shown on the far right. Click link for more APT images. There is more information on setting up an APT system, with notes on the hardware you will require, the tracking software you will need to predict when the satellites will be visible from your location, and the image processing software needed to turn the APT data from the satellites into images you can enjoy and enhance. Finally, there is a comprehensive tutorial page on using the entry-level WXSAT software to create weather satellite images, using your computer's soundcard to demodulate the satellite signals.